Meet your guide in the Piazza Campo del Palio at the appointed time to begin your walking tour. Travel back in time to learn about the origins of Asti as an ancient Roman settlement called Hasta, which later became an independent town with its own form of currency. During the Medieval era, the town went up against the likes of Milan, Genoa, and Alba in battle. Check out the glorious Asti Cathedral, the largest Gothic structure in Piedmont. See some 15th-century artwork, representing early Renaissance style in the region. Learn about some of Asti's traditional foods, including world-renowned wines and prized truffles. Hear stories of the former Jewish Ghetto in Asti and pay a visit to the town's covered food market. 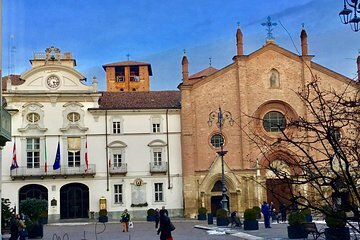 Admire the City Hall and San Secondo Church. Stop for a photo in the famous piazza where the Palio – the oldest horse race in Italy – is run every year in September. Experience the charm of Asti, a jewel of northern Italy, through its historic architecture and interesting past.